Great game to play, make time go fast. I find this game to be very well done. 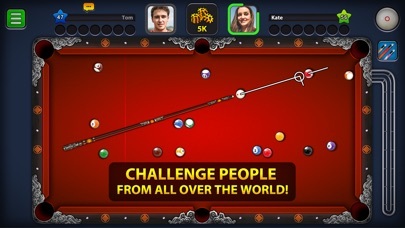 I play it daily and find it plays very close to TABLE pool. It's an awesome game, they will smack you up side the head continuously about offers to buy extra STUFF for the game (Cues, Money, Stats, Characters, Etc) and they are cleavers in how they do it. Great Game overall. Great game... love the club concept. 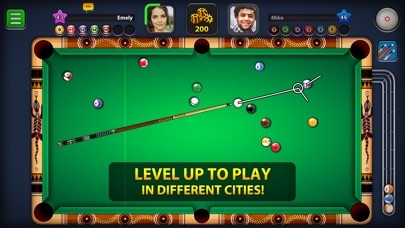 Yes, there are some issues but Miniclip works hard to resolve them. Love this game. We have a great club ... making new friends.... in-house challenges and friendly competition. Also love custom chat! Can’t say enough good things about this game! I. Love. It. Ok let me get straight to the point, I have the iOS version of this game and is fun to play a person whom is in the same level that you are in ok , so not true because I can’t know who is playing a straight up game , like I found out that people have a red beam that lets u play a perfect game with out missing shots so if u don’t have this red beam it will be in possible for u to win a fare game so u will be losing coins to people that are really cheating. Is funny because just the other days I was at my barbershop getting my hair cut so while I was waiting there was a guy sitting next to me playing the game, he had that red beam as I sat there and watch him he ran all his balls and won the game and six more right after another. So you tell me when will it end and when will we have a fare game. Luis irizarry. Great simulation that actually transfers to the table. Why can’t you fix your game.This is a joke. The game cuts out during play.. Finally got your software update today 4.4 version finally hoped this would fix the issues..No it didn’t. If I delete and reload the game I can play one game once the games over and I exit it goes to Updating mode and then I can’t play it again. This is ridiculous that you can’t do something about this. And your customer support is terrible no follow up after I emailed you several times. Noticed you removed the link for your customer support from your terms and conditions page..Obviously you don’t care.. I am so good at it from the start I feel like I’m going to be a pro like omg!!! I really enjoy playing this game. Great job!!! 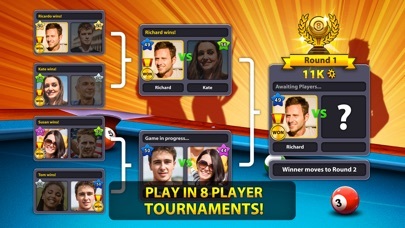 I have full service, play multiple games, bet $100k game and lose connect, lose game, lose $100k. From what I believe is the other persons connection. This is wrong and will cause me to no longer play this game that I’ve played for years, while experiencing this same issue on higher bet games. 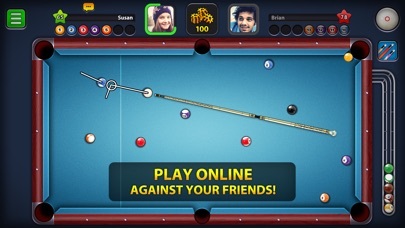 I think that this game should be recommended for people because it is a great way to make friends and play against friends. 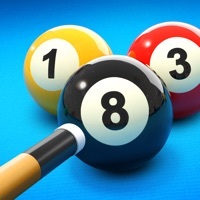 It is a fun game and it can help your abilities to play pool. I love playing this game! However, occasionally the game looses connection and kicks me off and I always loose my bet. When this happens, the coins should be returned to the player. I promise you this game is the best. I play it during school all the time even during recess. Since last update, game keeps crashing when trying to select different levels of games. This was a fun game.....once. It would be nice if you weren't playing against the computer program, the computer decides if you win, not skill. The daily spin is a joke, you get 100 or 150. Scratch and win you mostly get better luck next time. Good way to kill time though. I love playing this game but I can’t begin to tell you how many coins I’ve lost to somehow losing connection when I have almost full service. Even when I’m at home on WiFi the connection is somehow worse and I have no problems with anything else when I’m on WiFi or when it kicks me off when I have service. You would think with how much they make off this game they would fix some of those things. Just tired of losing money because of it. I am so happy to play, I’m not that good really, but some of the players are compassionate with me. Hahaha. But it is relaxing too. So right now I am enjoying this game tremendously! The game couldn't stop crashing on my iPad a while back, so I tried my iPhone instead, and it worked. Now I'm enjoying the game again. My game is glitching to the point where every time either myself or a person shoots, it takes a second and then the balls are in completely different places than before. Including the cue ball.